Quick overview The story of one of the world's greatest cover artists told through his iconic 1960s and 1970s Agatha Christie paperback designs, which influenced a generation of readers and artists. Includes a variety of other art and illustration from his 50 year career. The story of one of the world's greatest cover artists told through his iconic 1960s and 1970s Agatha Christie paperback designs, which influenced a generation of readers and artists. Includes a variety of other art and illustration from his 50 year career. The Agatha Christie covers painted by Tom Adams constitutes probably the most famous body of paperback art ever produced by a single artist. Between A Murder Is Announced in 1962 and Miss Marple's Final Cases in 1979, Tom was commissioned by Fontana in the UK and Pocket Books in the USA to paint covers for almost every Agatha Christie book, most of them more than once, totalling around 150 different paintings over two decades. They have been reproduced in many languages all over the world, defining the style of paperback artwork throughout the sixties and seventies and influencing a generation of artists and designers ever since. 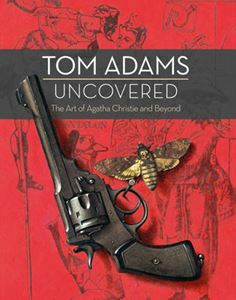 Tom's unique interpretations of the themes and stories in the books, often hiding clues about the plots within his paintings, have left an indelible mark on those who read those editions, and they are now highly sought after by fans of both Agatha Christie and Tom Adams. And Agatha Christie is only half the story. Concurrent with this extraordinary achievement, Tom was also producing art for other publishers, including an iconic series of Raymond Chandler covers and some brilliant jackets for books by John Fowles (The Collector, The Magus and The French Lieutenant's Woman), Patrick White (The Vivisector), David Storey (Saville), Peter Straub (Ghost Story), and Kingsley Amis (his James Bond pastiche, Colonel Sun). Tom Adams Uncovered is a showcase of the artist's best work from a career spanning more than 50 years. In addition to his many cover paintings, it features examples of Tom's broader work, including award-winning advertising, portraits, album covers, poster prints, and his work on the films 2001, Flash Gordon and Lifeforce. With captions by Tom and a commentary by the Agatha Christie historian John Curran, and concluding with previously unpublished Agatha Christie paintings, this book is a treasure trove for both crime fans and art lovers, and a fitting celebration of one of the world's finest cover artists.